Nails are made from keratin, a protein found in the skin and hair, according to the American Academy of Dermatology. Living cells in the fingers make the protein, which is then pushed towards the ends of the fingers where it hardens. Several factors, including age, environmental abuse and disease, can contribute to weak, brittle nails but there are ways to strengthen them using natural methods. Protecting the nails from the elements is one of the best ways to get strong, healthy nails. Trim nails to a short, squarish shape with slightly rounded tops. 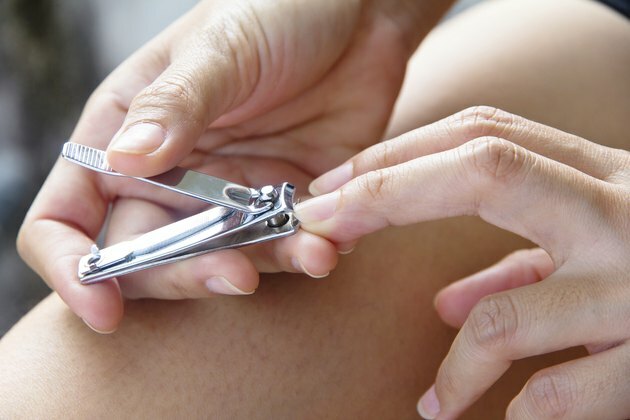 Use a nail clipper when nails are softer, such as after a shower or bath. Gently file nails with a fine nail file to remove snags or rough spots. Apply moisturizer to hands and nails several times a day, especially after hands have been in water, and again in the evening. Make sure to massage the moisturizer into the cuticles. The Mayo Clinic says rough, dry cuticles can cause hangnails, which rip at living tissue and can damage nails. Wear gloves to bed after moisturizing at night. Gloves can help lock in moisture and prevent the nails from drying out and becoming brittle. Apply a nail hardener. Nail products manufacturer, Sally Hansen, has several formulas for weak, brittle nails. Several of them, including Continuous Treatment Strength Formula, contain proteins that fortify and vitamins to nourish weak nails. Use a nail-fortifying polish alone or as a base coat. Apply nail polish. The Mayo Clinic says that applying a thin coat of nail polish may help nails maintain moisture. Remove old polish after a week. Protecting the nails from harsh weather, water, and impact can keep them from splitting or breaking. The Mayo Clinic says to refrain from biting nails, or using them to pick, poke or pry things. Wear gloves when submerging hands in water for extended periods, like while doing dishes. Water can actually weaken nails. The American Academy of Dermatology says frequent exposure to water can encourage bacterial growth, which can weaken and damage nails. Experts at the Mayo Clinic suggest supplementing with 2.5 milligrams of biotin, a B-complex vitamin. Other supplements, like gelatin, don't help, they say. The Mayo Clinic warns that using a nail hardener with toluene sulfonamide or formaldehyde can cause redness or irritate the skin. The Mayo Clinic also suggests only using nail polish remover once a week or less and to avoid those that contain acetone, which can dry out nails.